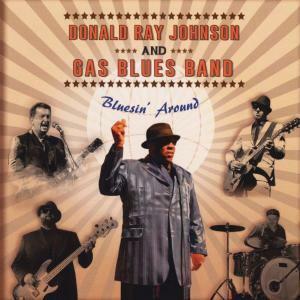 Blues’n Around by Donald Ray Johnson, with back-beats and instrumental contributions of the Gas Blues Band, is a great listen. Released September 19th on the Mar Vista Records, the album covers funky wah-wah to tasty licks that nicely compliment clean vocal renderings over classic blues melodies. It fades away all the worries of the day with smooth, soothing progressions that define the genre and are prominent throughout the new release. Johnson has a rich past in the music industry in disco and R & B.
Drumming for A Taste of Honey on the wildly popular Grammy Award-winning “Boogie Oogie Oogie” is one of his claims to fame. Currently living in Canada, Johnson has now turned his musical passions to the blues, and the vocalist is getting high marks from Maple Leaf Blues, Real Blues, and Living Blues magazines. The album’s 11 tracks run just over 44 minutes. Blues’n Around is a compilation covering collective favorites from previous sessions by Johnson and “Gas” Gaspart Ossikian – guitars, Phillippe Scamama – bass, Pierre Cayla-guitar, and Yannick Urbani on drums. Contributions from Daniel Antoine on the Hammond, Samuel Dumont on sax, and Nicolas Gardels trumpet round out the albums cast. “Distant” opens with a sweet wah pedal melody that fades back to carry the tune throughout. We enjoy the way the vocals and leads are woven into the piece. “Watching You” is reminiscent of Robert Cray’s unique style with a peaceful flowing in & out of crisp guitar tones, and the fabulous vocals Johnson brings to the party. “Should’ve Been Gone” showcases some brass that seamlessly melts into the melody, and we found this track to be a favorite. Blues’n Around is a welcome addition to any music library! Listeners will agree after spending time with it themselves.